Choosing which online sports betting site to place your bets with is no easy task. The criteria are a minefield of different welcome bonuses, varying odds levels and often complicated T&Cs. That’s why we’ve done the hard work for you and compared some of the biggest and best sports betting sites in the UK market. Whatever question you have about sports betting online, you’ll find the answer right here on this website. 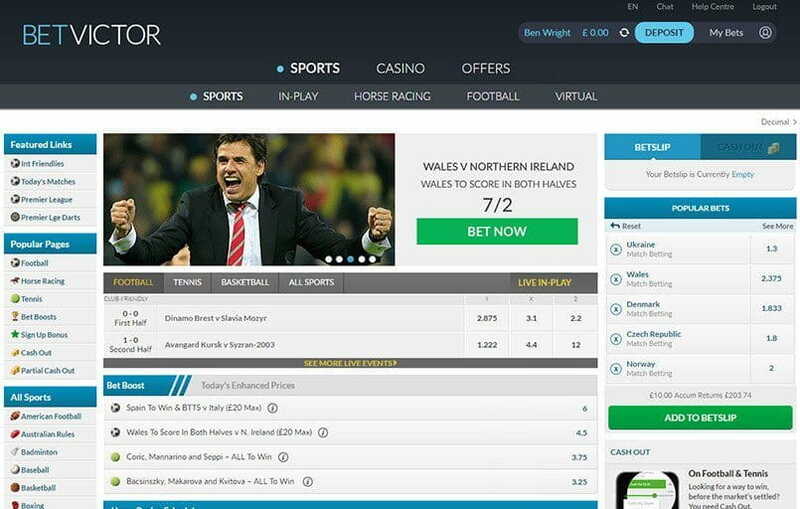 I’m James Thompson and on this site I’ve reviewed the best online sportsbooks in the business. I have over 20 years of industry experience, including as an odds compiler, so I know exactly what it takes to win! In total we’ve split the reviews into ten different categories. Firstly, this ensures that all aspects of an operator’s product are acutely reviewed and given the attention they deserve. Secondly, it makes for a good comparison tool between different sportsbooks in a given area. With that in mind, below you’ll find an overview and comparison of what we deem the most important categories when choosing which sports betting site to play with. These are without doubt the market offering, betting options and how high the odds are. But that doesn’t mean the other categories should not be considered when selecting a bookie. Live betting and live-streaming capabilities are especially important, while the mobile app and range of promotions will be significant for many punters. New customers to a platform will be especially intrigued about the welcome bonus and other promotions available on the platform. There are also assessments of the payment options, support and security, and a bonus points section rounds off proceedings. In fact, new operators are popping up all the time that are challenging the traditional bookmakers by providing new, innovative ways to bet on sports. On the surface, these modern operators may appear similar, but look a little deeper and you’ll find that these new betting sites have a range of unique features and attributes that set them apart. How Big Are the Sport & Bet Markets? For both casual and serious punters alike, wide and varied sport and betting markets are essential. The number of sports that are available, how many leagues per sport and the number of different betting options are all questions that need to be answered. The below table gives an outline of the sports markets offerings, while giving further information on the specific football markets and bet types available with each betting site, along with the special markets to be found on each platform. In many cases, which bookie constitutes the best in a specific area is subjective and dependent on the needs of an individual punter. For this reason, William Hill and Betway, who also both have excellent football coverage, should not be ignored. 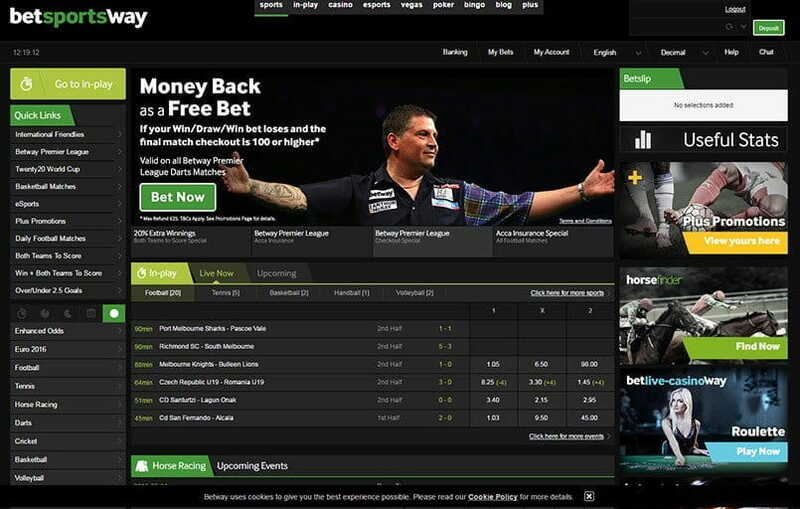 On the whole however, no-one can really compete with 888Sport and Paddy Power in this area, as they offer the most comprehensive and sophisticated betting and sports markets around, along with a nice amount of specials markets and bet types. How Are the In-Play Features? In-play betting is one of the innovations that has really helped online sports betting to take off. It’s such a huge part of it, that we’ve devoted an entire live betting page to it. 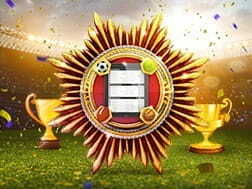 There we’ll run you through the in-play platforms, betting markets and also compare the odds levels for in-play events. 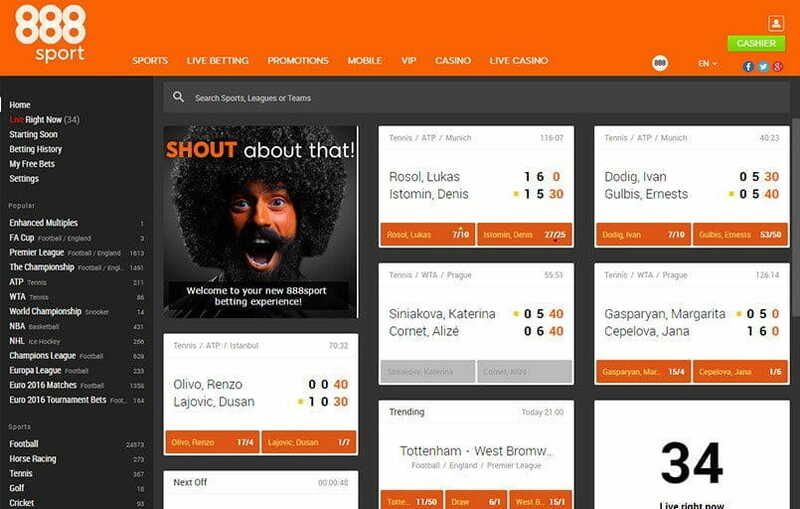 We found in-play betting particularly enjoyable at SportNation, but many betting sites are extremely strong in this area and worthy of your attention. The comparison table below has brought up some interesting results when it comes to how generous the odds margins at a bookmaker are. The major operators are of course prone to advertising their special prices and enhanced odds, or offering good odds for the most popular markets while neglecting the others. But how do their odds fare across the board when the odds levels for 10 different sports markets were analysed? Check out the table below to find out. To determine these results with fairness required comprehensive testing of a large number of fixtures for each sport. How we have tested the online bookies odds levels and the methods used are detailed elsewhere, but in short, the closer the percentage is to one hundred, the smaller the margin the bookie makes and the better the level of the odds. The numbers displayed are designed to show the range of the odds levels we encountered. Of course, there may be fixtures where higher odds than displayed here can be found from a bookie, but the percentages here give an accurate reflection of the range and average odds levels typically found at each operator. How Good Is the Mobile App? Another thing that has helped to revolutionise the world of sports betting is the rise of smart phone mobile technology. Studies show that the use of mobiles for sports betting has rapidly risen in the last few years and shows no sign of slowing down anytime soon. It’s essential then for a successful online sportsbook to offer a mobile app for at least one smartphone platform. How successful each sports betting site has been at creating a quality app differs however. Reviewing the mobile app of each operator is almost as big a task as reviewing the online platform, which is why there are separate reviews for each app, along with an overview and comparison of the performance of each operator’s app when put to the test. Who Has the Best Bonus Offer? For new customers to a platform the sign-up bonus is perhaps the most important criteria. However, I think it’s safe to assume that you’re not a member of each betting sites reviewed here, in which case, this is the perfect opportunity to read about and then take advantage of the welcome bonuses shown here that appeal to you. The sign-up offers here range from just modest right up to extremely generous, though the latter is becoming harder to find, with the norm being around £25. They also come in different forms, such as single free bets, multiple free bets or as funds directly into your account to be used somewhat freely. However, these welcome offers usually come with a host of T&Cs attached, which affect the playability and value of a bonus, as well as how and when any winnings can be withdrawn. Some welcome bonuses even require qualifying bets to be made before any bonus funds become available. As I’m sure you can tell, once again this is another huge and varied area and you can read all about the bonus offers in detail in the bonus section. The payment options available can make a big difference to many punters. It’s true that for most, this criterion won’t be hugely important, since the most popular payment methods – credit and debit cards – are almost universally accepted. But with the rise of e-Wallets and other less common methods, this aspect demands attention. The major payment methods are available pretty much across all the betting sites here, though some betting sites do have a particularly wide range of payment options, which reflects badly on those with a more confined range. One important factor relating to payment options is whether an operator supports PayPal or not. Not only is it the most widely used e-Wallet in the world, but an association with PayPal reflects well on a sportsbook, since PayPal only associates with established, licensed and regulated sports betting sites. Many punters look out for the PayPal logo as a sign they can trust abetting site. One important factor relating to payment options is whether an operator supports PayPal or not. Not only is it the most widely used e-Wallet in the world, but an association with PayPal reflects well on a sportsbook, since PayPal only associates with established, licensed and regulated sports betting sites. Many punters look out for the PayPal logo as a sign they can trust an online sportsbook. Are There Extra Markets & Features? As sports betting sites have grown and grown in size and popularity, so too have the types of bets they offer. Alongside the traditional sports bets, most providers now offer other betting markets, such as politics, finance and entertainment. Some operators also have a host of other features designed to enhance the experience and also assist punters when betting. 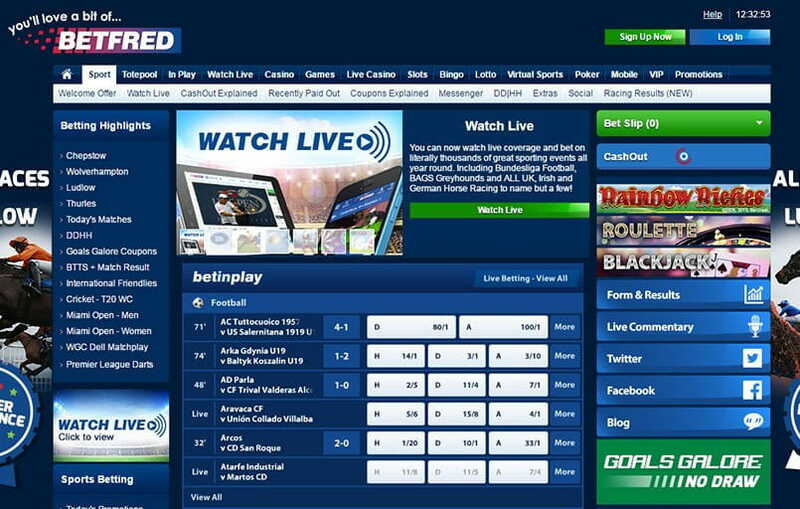 The usual live scores and statistics are often combined with form guides, results and tips for example. A couple of bookmakers also offer audio commentary where live-streams for a fixture aren’t available, which is a particularly nice touch. How Secure Are the Websites? While many people wouldn’t consider security when selecting which betting site to play with, it should be among the top considerations. That said, there’s not too much to differentiate those operators reviewed here when it comes to the security of their online platforms. Security is a top concern for each betting site, as they face strict penalties should security breaches occur resulting in the loss of customers’ data or details, and the law dictates a certain level of security must be in place. All operators encrypt data being sent to and from the site. Thawte is a popular provider of IT security judging by the table. The level of encryption varies between 128bit and 256bit, though the difference is fairly negligible. Some of the sportsbooks only encrypt transactions, such as when you’re depositing and withdrawing, while others have encryption protection across the whole platform. Bear in mind then that all the operators offer a more than satisfactory level of security when viewing the overview table above. But we have tried to take all aspects of safety and security into account in an attempt to accurately rate, but also to differentiate the operators’ performances, where possible in this area. Towards this, we’ve paid consideration to which (if any) organisations or platforms the bookmakers are associated with towards maintaining integrity and fairness in sports betting and for providing support for responsible gambling, as well as the IT security systems. This allows a more complete picture of the level of security considerations and measures taken by each provider. Another area that’s probably not at the front of most punters’ minds is the quality of the customer service offered. Especially since the introduction of live chat assistance, which is usually accompanied by round-the-clock service, most punters feel they will be able to access an acceptable level of assistance should they ever need it. However, our research suggests this is a dangerous assumption to make, since some of the betting sites reviewed here do not offer live chat assistance. While the table above shows the methods of customer service that should be easily contactable and helpful, in reality, this might not be the case. In truth, it’s often not. Looking at the range of help methods available is not sufficient in accurately rating a bookie’s customer service. That’s why we put the bookies to the test by utilising all the customer service methods available and testing the response times, helpfulness of the response and general assistance level from the customer service representatives. The results of these tests are reflected in the rankings shown above. Betway and 888Sport top the rankings due to these reasons. While other operators such as William Hill or Ladbrokes offer exactly the same methods of assistance, the quality of the assistance, response time and waiting times were generally better at 888Sport and Betway, which explains why some operators with the same contact methods achieved different scores in this area. One or two unique features or functions can often make all the difference when it comes to beating the competition and being the best online betting site around. With the extras rated here we’ve tried to account for these extra features in the overall ratings of the bookmakers. These bonus points are separate to the categories listed and consist of numerous individual categories, with a total of 10 points up for grabs, in areas such as live-streams and the bonuses and promotions available. 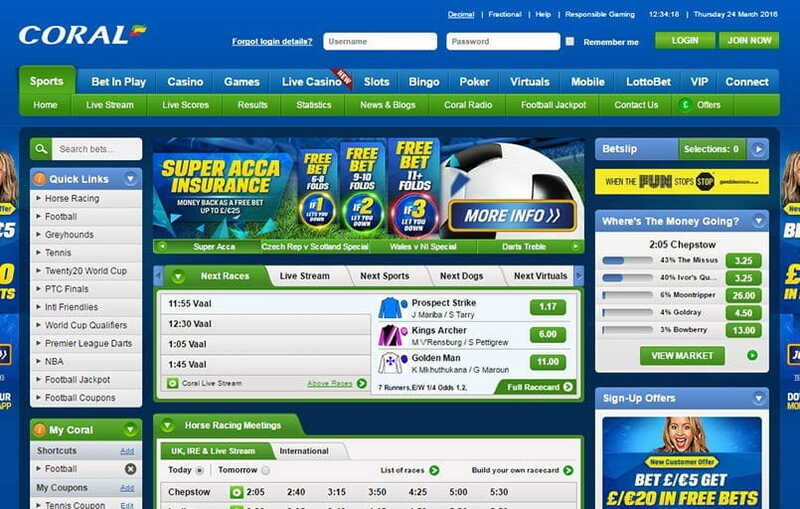 How Have We Tested the Online Bookies? To fairly and consistently review each bookmaker we devised a research intensive strategy that was designed to test each bookie to the limit in all of the categories. We spent hours on the online platforms, mobile apps and examining the in-play arenas to give you the low down on everything that matters. Not only has this time intensive approach paid off in regards to the level of detail we could go into for each category, but it also meant we really got to know each platform and operator and encountered many special features and nuances which are sure to interest many readers. But there was of course also method to the madness. Below we’ll outline the specific tests we put each betting site through and the formula used to work out the quality of the odds at each operator. In truth, all the operators here offer decent odds across the major sports. Better odds are one of the strong points of online betting, due to the competition for customers among the leading sports betting operators. However, the quality of the odds can make all the difference when it comes to choosing which betting site to regularly play with, especially for the more serious high-rolling punters. Small divergences in odds levels can make a huge difference when it comes to profits, particularly when betting with high stakes. But there are many more questions to be asked than simply, “where has the best odds”? Odds levels can differ between sports, markets and whether the bet is in-play or not. The key to working out the quality of the odds at any particular operator is to calculate the bookmaker’s margin. Bookmaking has been around a long, long time and the online bookies know their business inside out. The margin acts as insurance for a bookmaker against all possible outcomes from an event, so that whatever the outcome, the bookmaker should be insured against making a loss. The size of the bookmaker’s margin is directly relative to how generous or frugal the odds are from a punter’s perspective. Generally, the larger the margin, the smaller the potential profit from a winning bet. Conversely, the smaller the margin, the higher the profit that can be made. 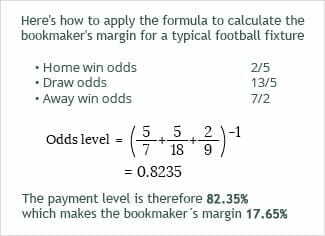 The formula above shows how one can calculate the bookmaker’s margin for any event. The formula works for any sport, whether football, tennis, or even horse racing. The main thing to consider is that all potential outcomes must be accounted for when calculating the margin. Taking football as an example, a standard league match has three potential outcomes; home win, draw, and away win. So in this case, the calculation would take the odds from each of the three outcomes. A typical tennis match has just two outcomes, since a draw is not possible in tennis. So in this case, the calculation would just involve the odds from the two possible outcomes; player A win or player B win. Sports with more outcomes work exactly the same way. So with horse or greyhound racing, simply make the calculation using the odds for each competing horse or greyhound, whether six or more. The example to the right demonstrates how the calculation works, using football as an example with fractional odds. Taking the odds from all three outcomes of the football match and applying them to the mathematical formula, we get the answer 0.8235. Simply move the decimal point two places, which gives us 82.35. The odds level is then 82.35%, which we can subtract from 100% to work out the bookmaker’s margin, which is 17.65%. This is a large margin and is not really typical for a football fixture with an online sportsbook, but it works well as an example. The margins will vary between sports and also between different fixtures from the same sport market. Some of the bookies we tested here had a surprisingly large range of odds levels within the same sport. Check out the odds comparison table to get the full picture on the odds levels across all the operators reviewed here. Generally, the more outcomes from an event, the higher the bookmaker’s margin will be and the lower therefore the odds level for a punter. The comparison table proves this point as the odds levels are clearly lower across the board for horse and greyhound racing. But how do these small differences in the bookmaker margins between operators translate into real money? The table below contrasts the actual returns with the odds level set at different integers with a difference of 2% from a bet stake of £10. It’s pretty clear to see that when playing for these small stakes, minor differences of 2 or 4% do not make a huge impact on profits. From this we can conclude that most won’t be losing out on too much when using any of the operators whose odds levels only differed by a few percentage points. Those betting for higher stakes should ensure that they are getting the most value however, as the differences will be more significant when higher stakes are involved. A stake of £1000 used on the highest odds level in the table would earn an extra £187 than the same bet on the lowest odds example in the table, which suggests that higher stake players should pay particular attention to the odds levels at various sportsbooks. All serious online betting site offer numerous contact methods for their customer support, with the majority offering the most frequently used live chat method. While the two operators here who don’t have live chat support immediately lost points due to this, it is simply not enough to rate each bookmaker based simply on the forms of customer service available. To this end, we tested and rated each support method from each betting site on a number of criteria, beyond simply the methods of service available. These criteria were the response time to questions posed, the quality of the answers provided and the general level of assistance. We tested these criteria across live chat, phone and email, to give a comprehensive reflection of the overall standard of customer service at each operator. This is why the scores vary between operators that may have exactly the same methods of customer service. Longer waiting times and inadequate or unhelpful answers and service from customer service representatives resulted in points lost for a sportsbook. The scores given for customer service represent the results of these tests more accurately therefore and not just a score given for the range of customer service help methods available. The payment options available is another area where service appears to be fairly equal across the operators. This is one of the trickier areas to objectively rate and rank each operator. All the operators here offer at least a good range of different payment methods, with the usual credit and debit card options accompanied by a range of e-Wallet or transfer options. The main variables here are the minimum and maximum amounts allowed for deposits and withdrawals, along with the processing time taken between the different methods. Again, the details listed by the operators for these criteria are fairly similar throughout, but certain aspects – namely the processing times for funds to appear in your account and to be withdrawn into a bank account – required testing to ensure that the details given are accurate in reality. We have therefore listed all the variables and where possible, tested the accuracy of the data which could vary when put into practice. How user friendly a platform is can be tested by examining its functionality. To test this, we’ve examined important areas of functionality; how many clicks does it take to place a bet, how seamless is navigation to the different sections on the platform and are there quick links to popular sections? The results of these tests contributed largely to the rating for an operator’s platform. But the layout and design of each platform is also an important factor. A poorly chosen colour scheme, lack of clarity of important aspects or poor navigation resulted in lost points in this area. Of course, which platform one prefers above all others is a subjective decision, but that does not prevent the rateability of the user-friendliness and functionality of an online platform. How User-Friendly and Functional Are the Online Platforms? How Were the Bonus Points Awarded? While in this bonus points section we wanted to have a little fun and give each operator the opportunity to pick up some more points, it also serves as the category in which we can bring together all the smaller areas that are relevant to the quality of an online sportsbook, but do not demand a full category themselves. Some are particularly important to the overall experience of betting with an online bookie however. 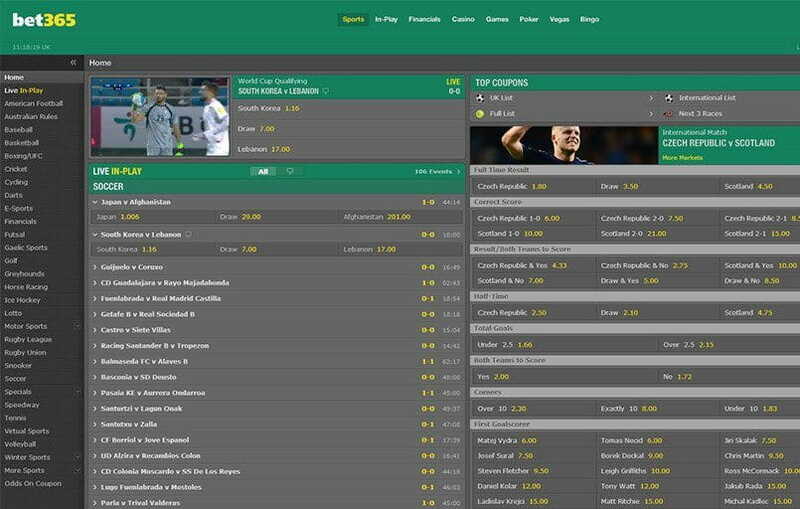 For example, a large number of high quality live-streams available can really make a betting site more attractive than a competitor. There are further points available for sponsorship and the calibre of the awards a bookmaker has won. Bonuses and welcome bonuses are other areas that will matter a lot to most online sports betting fans. A range of regular promotions and bonuses can help to raise both excitement and profit levels for any punter. For this reason, we’ve analysed both the quality and range of promotions, specials and bonuses available at each operator. Also important to the quality of a modern online sportsbook are the extra markets outside of sports. Financial, political and cultural betting are all now much more prominent, so we’ve evaluated the range and depth of the extra markets at each bookmaker too. If you’re new to the world of online sports betting but have visited your local bookmakers physical store before, you might be curious just what all the fuss is about and what is so different about betting on sports online. Firstly, you’ll have to create an account with an operator, filling in personal details along the way. Many operators will require that you provide photographic evidence of your identity, such as with a passport or driving licence. Think of it as being similar to having to prove you’re over the minimum legal age to gamble if asked when in a betting shop. This process is called Know Your Customer (KYC) and is something the bookmakers take very seriously, with pressure coming from regulators and Government. It’s not just to prove that you may legally gamble, but to help prevent money laundering and illegal activity through online sports betting. Placing bets can only take place once you’ve made an account and is again a little different. First, you must deposit funds into the online account, then you may place bets with these funds. Getting your hands on any winnings is also different. Withdrawals can only be made via the payment options available at a bookie. Some bookies also require the withdrawal method to be the same method used to deposit funds. We’ve highlighted the main advantages and disadvantages between the two in the table below, but there really are loads more differences, far too many to cover them all here. But there are some key differences and key advantages that really make online the place to bet on sports. In terms of functions and possibilities, the biggest difference between the two has to be the in-play and cash out options introduced by online sports betting, that have revolutionised the industry. In-play betting does exactly what it says on the tin, in that it allows you to make bets on sporting events while they are on-going. This gives the punter lots more opportunities to spot bets that are likely to pay off, by paying close attention to the event. 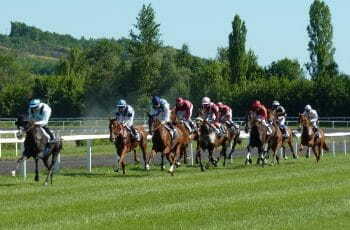 It has also introduced new types of betting options, many that are unique to online and in-play betting. Bets such as which player will be carded next in football or who will win the next point in tennis are two good examples. These types of bets have not only brought a new level of excitement to sports betting, but have also helped elevate the opportunities for profit, as in-play bets can win in a matter of minutes and bets can be won in quick succession when successfully betting in-play. In-play betting also introduced a new aspect to online sports betting, the cash out function. Again, the clue to the function is really in the name; cash out allows a punter to essentially cash out a bet early, before the sporting fixture upon which a bet has been placed has concluded. The cash out function can be employed by a punter one of two ways and I’ll explain using a bet on a football match to elaborate. Let’s say you’ve bet £10 with odds of 2/1 on team A to beat team B in football and team A are currently leading 1-0 with 30 minutes left to play. But, team B are currently dominating the match and them scoring looks a matter of when, rather than if. So, you’re not confident that the bet will win. But, through cash out you can still ensure a profit. A bookmaker will offer you a price to settle the bet early, based on the current probability of the bet winning. So should you settle the bet early and cash out and team B go on to score and the match ends 1-1, you would have won a bet and made profit through using cash out, when the bet would have lost had the cash out function not have been employed. An alternative way to utilise cash out is to use it to negate against potential losses. Should team A be losing 2-0 at half time and the game looks all but over, you would be able to cash out a small portion of your stake, meaning you haven’t lost the full amount. In the spirit of innovation that many online sportsbooks embody, the cash out function has been modified a little in recent times. Some operators, like Coral and Betfair, now offer a sliding scale or partial cash out, which allows a punter to cash out a partial amount of the stake on a bet, while leaving the rest of the stake to play. This strikes a good medium between the two uses of cash out, so losses can be negated while leaving a portion of a stake live. Exchange Betting: How Does It Differ from Traditional Sportsbooks? Another innovation brought about by the possibilities of the internet and online sports betting are betting exchanges. Exchanges give punters the opportunity to bet against one another and to lay a bet, taking the role of a traditional bookmaker and effectively betting against an outcome. So a punter can decide what bet they want to lay, offer odds, how much they are willing to bet (liability) and wait for another punter (a backer) to take the bet. The key differences are that you are essentially betting against other outcomes, like a bookmaker, and that you are betting against another person, rather than a sportsbook. You can also play the alternative backer role by matching a player’s laid bet and odds. Another advantage of betting on an exchange is the higher odds you’re likely to find. Since you can choose the odds with which to lay at and only match bets with odds that you think are a good price, you’re sure to always get odds you find acceptable. The downside is that users of an exchange will have to pay commission to the owners of the platform, which will negate against the winnings from the higher odds. Just one of the bookies reviewed here – Betfair – has a betting exchange and they state that odds can be up to 20% higher. There has been a lot of talk about the commission fees at Betfair in recent years, especially since they introduced premium charges a few years ago. These have been widely criticised as being harsh on players, especially those making larger profits on the site. In any case the fees for using the platform do lessen the appeal of the higher odds somewhat. 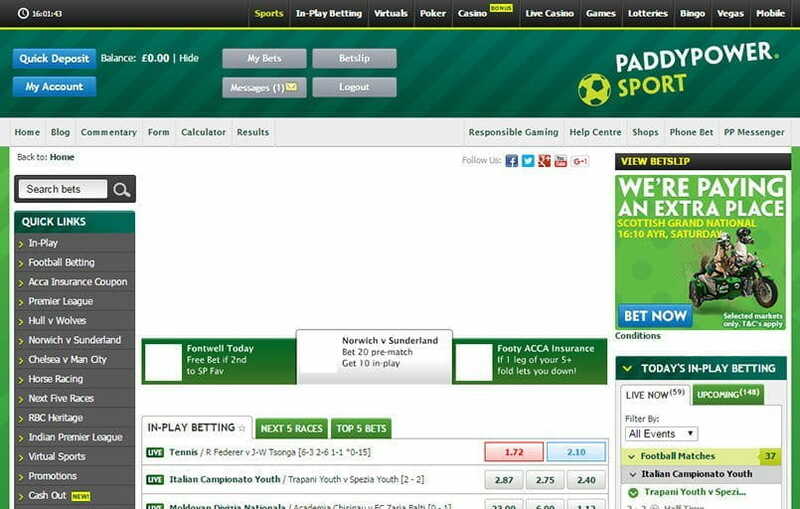 It goes without saying that you should ensure an online betting site holds a proper UK licence before you begin playing. The relevant authority in the UK is the Gambling Commission, which was established in 2005 as part of the 2005 Gambling Act. The Gambling Commission was created to regulate commercial gambling in the UK in partnership with other licensing authorities. Its offices are based in Birmingham in the UK and there are around 250 employees. The Commission aims to regulate in a transparent, accountable and consistent way. To achieve this, it demands that all operators holding a UK Gambling Commission licence must comply with the Government legislation and also with the associated Licence Conditions and Codes of Practice (LCCP). This helps to ensure consistency across the sector and assists the Commission in its regulation of the industry and helping it to remain transparent. Many of the biggest online sportsbooks operating in the UK are based offshore in places like Gibraltar or Malta to take advantage of the favourable tax conditions. Things changed for these operators in November 2014, when the Gambling (Licensing and Advertising) Act 2014 came into force however. The Act requires that operators who want to advertise their services to consumers in the UK must obtain a licence from the UK Gambling Commission, even if they are based offshore. This is why many of the operators here have more than once licence, since they are licensed by the relevant authority where they are based (such as the Government of Gibraltar for those operators based there) and the UK Gambling Commission. These regulatory changes were introduced to ensure that remote operators can be subject to consistent regulation by an established UK authority. An associated bill in 2015 also imposed a new 15% tax on all bets taken from UK customers by offshore operators, by changing the tax structure to the point of consumption. This has been met with resistance from many sportsbooks who had previously operated in the UK, with some choosing to exit the UK sports betting market altogether. 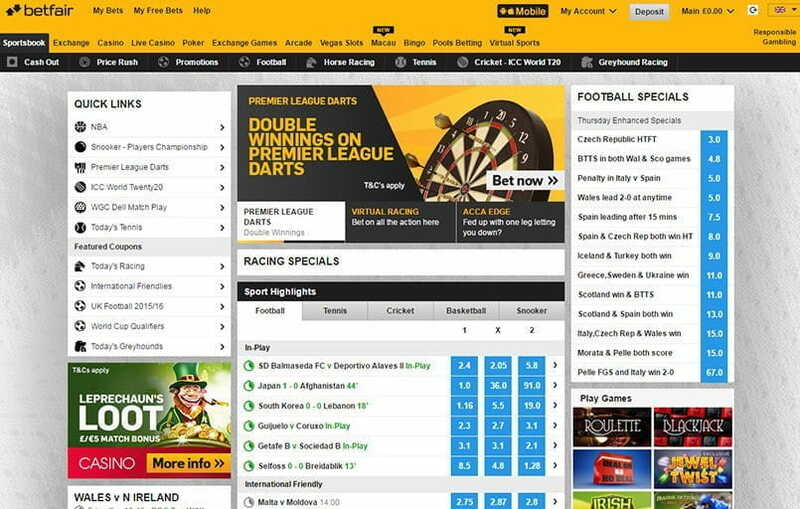 In truth, you can’t really go wrong with any of the online sportsbooks we have reviewed here. All offer sufficient market and betting coverage, with at the very least the major sports and leagues covered, along with numerous extras. But I’m sure that after reading this page you’ll be aware that there are plenty of subtle differences between each operator that can make a big difference on its overall standard as an online sportsbook. By putting each operator through a rigorous test and comparison designed to highlight any flaws, we’ve been able to give a complete picture of the quality of each provider reviewed here, and compare and contrast them accordingly. By comparing each aspect of each operator, we’ve been able to fairly and consistently rate and rank the sportsbooks in 10 separate areas – such as betting options, in-play features and how high the odds are – to give a combined overall score reflecting the complete standard of each bookie. The ultimate goal then, was to find the overall best online sports betting sites available in the UK once all these aspects had been considered. As we mentioned above, there cannot be one single winner. 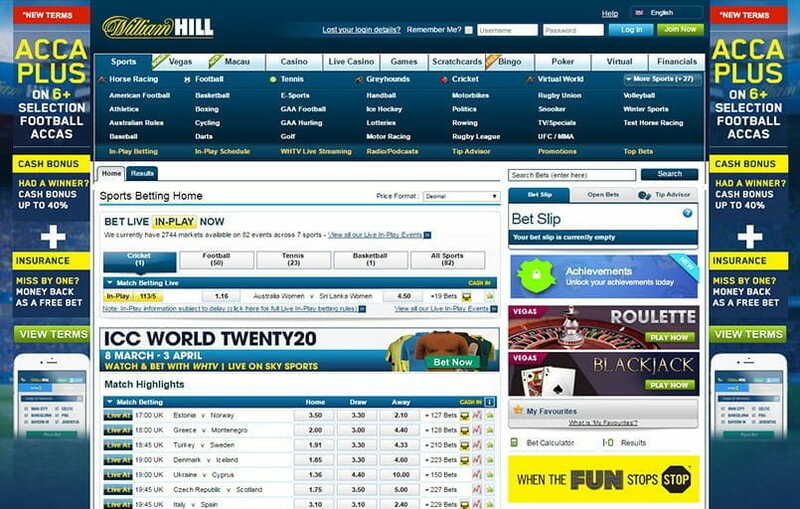 Most of the major sportsbooks, like 888sport, William Hill, and Betfair, all offer excellent all-round service. However, different operators excel in different areas and this is why we are proponents of having accounts at multiple sportsbooks. This means that if you want to get the best odds and squeeze out value, you know where to go. Need the most in-play betting options? Then head to a different operator. Want the best bonuses? Another operator will have you covered. Hopefully it’s clear from all our research above which sportsbooks excel in which area, but if you must know our favourite all-rounder, then we feel 888Sport is a very strong operator.